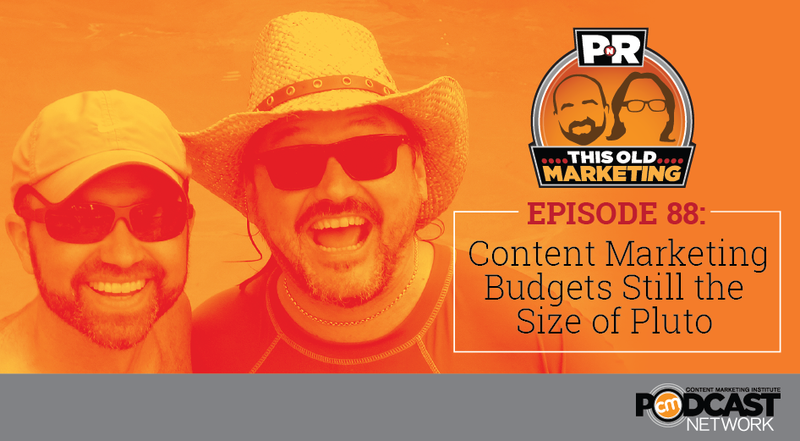 In this week’s episode, Robert and I discuss the massive growth of how-to videos on YouTube and what marketers need to do to differentiate their video content. Next, we discuss two research studies that show customers favor doing business with trustworthy organizations that have clearly articulated values; we explain how content marketing strategy fits into the picture. Finally, we take a closer look at the savvy spending habits of the top 200 U.S. advertisers. Content marketing spending is still very small compared to the billions that brands invest in paid media, but it can be very powerful, as Estee Lauder has discovered. Raves include Mark Zuckerberg’s new focus on content and Comic-Con’s cornucopia of native branding opportunities. We wrap up the show with a #ThisOldMarketing example of the week from Disney. Demand for how-to content on YouTube is on the rise (3:35): According to a report from Google, a growing number of consumers are turning to YouTube to search for how-to videos. According to the Google report, 91% of smartphone users turn to their smartphone for ideas while doing a given task. Robert and I agree that only producing how-to videos isn’t enough for brands to differentiate themselves. Also, videos need to be truly focused on customer needs, not just about the company’s products and how to use them. Consumer trust crisis: Companies excelling in candor substantially outperform the market (12:18): Companies that go the extra mile to earn trust are outperforming the market by an average of 9%, according to new research from Rittenhouse Rankings. Top-ranked companies that have demonstrated accountability, candor, and trustworthy leadership are JetBlue, Sony, and Humana; conversely, trust toward Walgreens, Target, and Coca-Cola has dropped the most in year-over-year rankings. The lesson for content marketers: Get rid of clichés and business jargon in your communications. Be human and honest. Solve customers’ problems. Beyond the brand: Culture takes the lead as primary driver of long-term business relationships (21:10): In the age of transparency, a strong corporate culture has become the primary driver of long-term business relationships, according to a new global survey of 500 executives conducted by the Fortune Knowledge Group in collaboration with global ad agency gyro. The report, entitled Beyond the Brand: Why Business Decision Makers Buy Into Strong Cultures, has found that business decision makers are placing greater significance on a business partner’s culture than ever before. Robert and I agree that an organization’s content must take a stand for something – but that’s often easier said than done in many firms. What the top 200 U.S. advertisers are doing to spend smarter (27:43): U.S. ad spending for the 200 Leading National Advertisers (LNA) rose a slim 2% in 2014, but the big story is that advertisers are spending smarter. Ad Age’s annual LNA report shows how blue-chip marketers are getting more bang for their billions of bucks by doubling down on digital and taking unnecessary costs out of marketing. Content marketing spending still pales by comparison but does offer savvy brands a very attractive ROI – especially if the brands being promoted are backed by strong stories. A case in point: Robert cites a Wall Street Journal article about Estee Lauder’s approach to promoting several artisanal brands it recently acquired. This Old Marketing is sponsored by Acrolinx, a platform that helps the world’s most recognized brands create more engaging, more readable, and more enjoyable content. 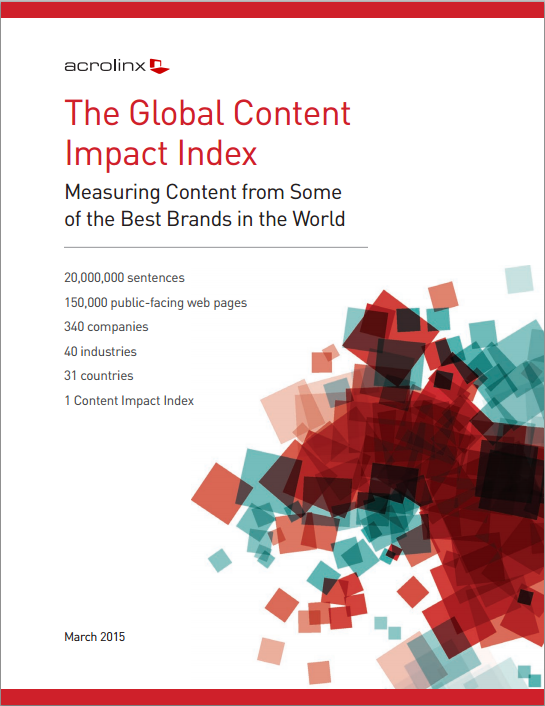 It’s offering a new report, called The Global Content Impact Index, which shares the results of its detailed analysis of the world’s content. Using a proprietary linguistic analytics engine, its software reviewed 150,000 individual, public-facing web pages from 340 companies around the world. That represents 20 million sentences and over 160 million words. The results were surprising. Learn more at http://bit.ly/acrolinx-global-index. Joe’s rave: As I’ve perused Facebook lately, one person keeps showing up in its list of recommended people I should follow: Mark Zuckerberg, CEO of the popular social media channel. 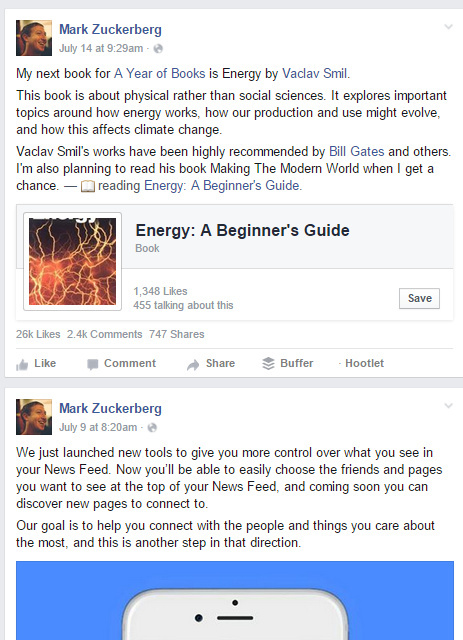 When I clicked through to view his page, I discovered that there’s a content strategy behind it. Every couple of weeks, he publishes blog posts that include book reviews, commentary on the news, and social issues, plus Facebook employees working on interesting projects. There is an impressive level of consistency in the stories he’s telling and their point of view. Robert’s rave: Robert loves this Ad Age article about the recent Comic-Con convention in San Diego, where brands drastically stepped up their game to provide native experiences for attendees. He loves the way brands brought the concept of native advertising to life, creating engaging experiences that blended their products and services into the overall feel of the event. But native advertising opportunities aren’t limited to comic book publishers and movie studios: Comic-Con invites attendees to participate in the experience by dressing up as comic and fantasy characters. 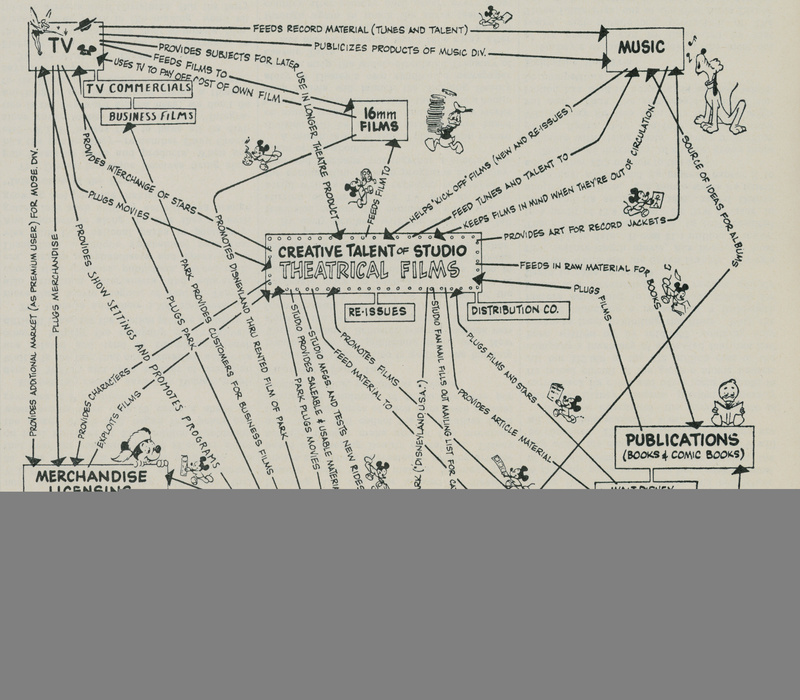 A Disney infographic: In 1957, Walt Disney created a hand-drawn infographic to explain its multifaceted business model to investors. At the center, of course, is Disney’s theatrical works – which are always based on compelling stories. From there, the company’s channels and distribution strategies radiate outward and interconnect. This detailed diagram makes it very clear what the corporate objective is for each channel, and how they reinforce and support each other. It’s so compelling that I may have CMI’s artist create a similar diagram to help our staff and others understand all of the pieces of our business, their objectives and how they support each another. 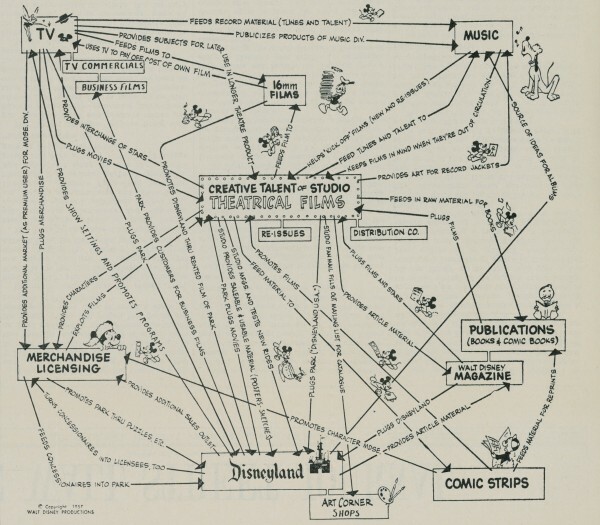 This infographic, which elegantly tells Disney’s marketing and distribution story, is almost 60 years old. That makes it an excellent example of #ThisOldMarketing.